Enjoy my new cartoon … and a happy Thanksgiving! Don’t forget to share it, of you like it! Sign this petition to STOP animal abusers! It’s a good thing that there are people also caring about the weakest members of our society. Animals and pets in particular clearly count towards that group. While many pets luckily are living a happy and pampered life, others are not so lucky. Being abused, beaten or neglected – if lucky – ending up in shelters – if unlucky – tortured until dead! Hey guys, I know, it’s been a while. But here I am back with a new dog fact. 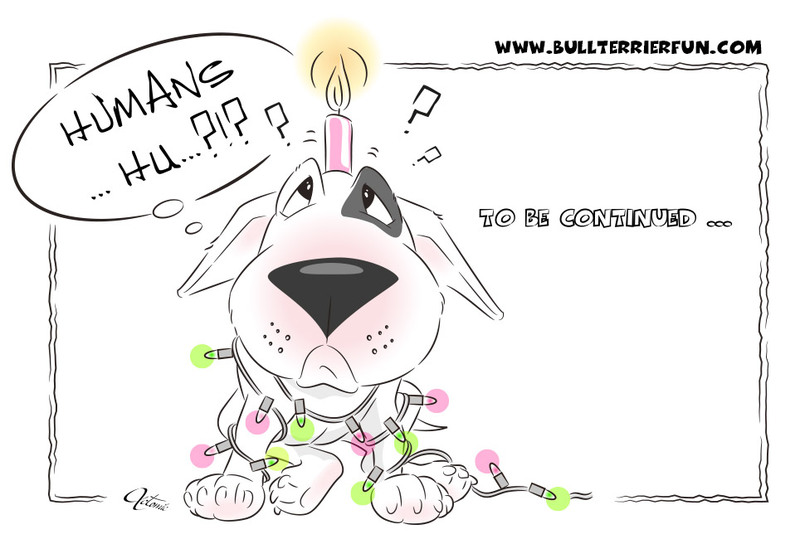 Today I want to talk about misunderstandings between humans and dogs and the important role of understanding dog behavior in the relationship with your Bull Terrier. Misunderstandings are what causes the majority of problems between humans and dogs. Let’s first talk about human behavior and how Bull Terriers and other dogs in general perceive and how they may misinterpret it. For example, did you know that a friendly, bright and teeth exposing smile of a person can be interpreted as an act of aggression by the dog, especially when the person also looks the dog straight into the eye? Last Friday we have returned from our very first vacation with Mila – and the three of us really had a great time together. We had decided to camp in a tent at one of the best pet friendly campgrounds in Florida, shortly over two hours away from our home: Fort De Soto Park. The weather was perfect and so was the campsite! Watch Mila play and have tons of fun in her latest photo story: Her travel report of her very first vacation at one of the best pet friendly campgrounds in Florida: Fort De Soto. 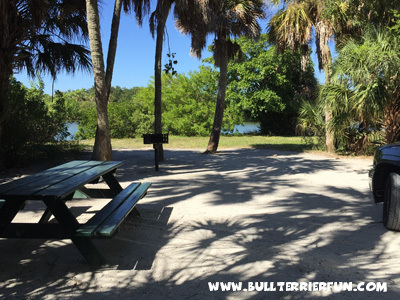 If you are looking for information about the pet friendly campgrounds at Fort De Soto Florida, find more information in my travel report about our trip to Fort De Soto or visit the official campground website of Fort De Soto Park.